As a marketing agency, it's not uncommon for us to meet clients that are both excited and totally overwhelmed by the mountain of information in front of them. Luckily, with a little perspective and guidance, the right solutions quickly become clear. What separates our company from our competitors? Why do our clients prefer my team or brand over other options? Why does my company exist in today's market? Once you’ve done a little soul searching and connected the core dots above, it will be easier to move to the next step. 1. Create a typical “biography” for your ideal customer(s) identifying key demographic details like age, gender, profession, income range, etc. 2. Narrow down their personality type(s). Do they like to take their time browsing? Are they more of an impulse shopper? 3. Draw up a typical background for them. What does their day to day look like? Are they always on the go? Do they live a more relaxed lifestyle? 4. Identify their goals, as well as the solutions you provide for them. Why does someone need your product? What “want” or functional purpose does it fulfil? 5. Explore common objection points that you encounter with your ideal customer. 6. Find out what preferred marketing channels your customers frequent. The whole idea of the exercise is to gain insight on the clients perspective and provide you with additional knowledge on how to reach them in the way they wish to be reached. What channels should I start with? An integral part of the conversion process is understanding that customers value feeling like they have the ability to research their own solutions without pressure. Search engines like Google provide users with access to information that directly addresses their problems, allowing them to feel empowered in the decision-making process. Your website and content should do the same. Therefore, your first priority should be to ensure both your website and content are designed to provide an exceptional user experience and establish your business as a thought leader. 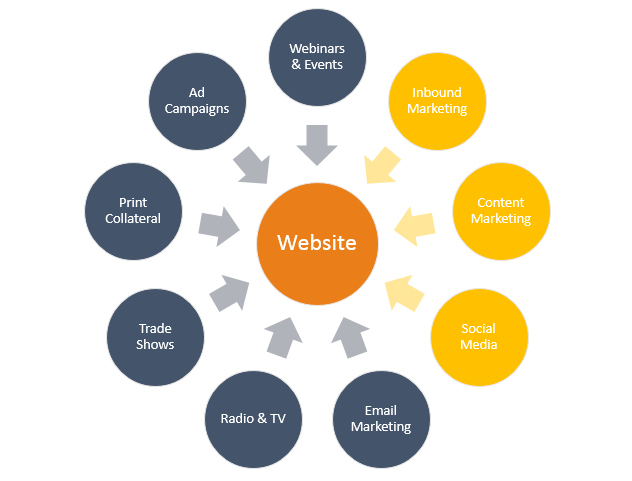 From there, you can build a Marketing Mix Web by considering the following:What marketing activities do you pay for? Which activities do you perform on your website? Are there any business development events or trade shows? What do your sales staff do daily that try to connect themselves with prospects? Take this list and spread them out in a circle all directed towards your website. TIP: Each marketing activities must drive traffic towards targeted content on your website as you have more analytics and the ability to control the user experience. What if my program underperforms? No matter where you are on your digital marketing journey, the correct knowledge base will help you make educated decisions on which programs you should run. Digital marketing provides businesses with full transparency through the use of analytical tools, meaning you’ll be able to easily keep track of your results. Analytics also allow you to reverse engineer solutions for any areas underperforming using the data you have collected. It’s not always easy making uneducated decisions. If you can gain a clear understanding of your business, its clients, and the landscape your operating in, then there will always be low hanging fruit to grab. Running more complex programs may require expert advice, however, a marketing mix exercise will showcase which are to focus on next. Developing a marketing mix can be difficult without the right knowledge to guide your decisions. With a clear understanding of your business, your consumer base, and overall landscape that you operate in, finding and converting leads will become a streamlined process. To learn more about developing a solid digital marketing mix, understanding your customer base, and generating qualified sales lead, contact our team of experts today! Stay tuned to our blog for regular industry leading insights as well.